I drove past "The Den" today and took this quick picture. I've always tried to avoid anything to do with Millwall because when I was growing up they were always associated with the worst elements of football, although many fans would argue this is down to the press needing a hate figure. A former Chairman of the club, Reg Burr, once commented; "Millwall are a convenient coat peg for football to hang its social ills on." I thought it was time I hit Wikipedia to find out more now it's rumoured that ex-Liverpool ace Robbie Fowler could be playing for them. Gossip suggests that Fowler is one of the richest men in English sport due to his massive property portfolio - so expect those empty Blackheath properties to be snapped up soon! 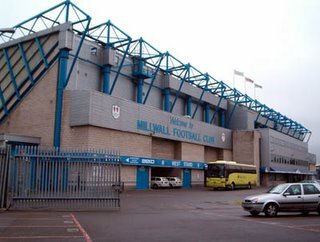 Millwall Football Club is a football team based at the 20,146 capacity New Den Stadium in Bermondsey, Zampa Road, south east London, England. They currently play in the Football League Championship. Their team nickname is The Lions, fomerly The Dockers. They changed the nickname after their FA Cup run of 1900, to the semi final, after being refered to as "Lions," for their acts of giant killing, adopting a lion emblem, bearing the legend; "We Fear No Foe." The emblem, along with its legend, was not added to their shirts until the 1930's. "We Fear No Foe" was changed later, however, to just "MFC." They also reached the semi final in 1903, 1907 and 1937. Their 1937 appearance was notable, as they became the first team in the old third division to reach the last four. Their "traditional strip" consists of blue shirts, white shorts and blue socks. The club was founded in 1885 as Millwall Rovers, by Scottish dock workers from the town of Greenock, where the local Scottish Football League side Morton F.C. share the clubs' colours. The club's name comes from where it was founded, at the Millwall Docks on the Isle of Dogs, across the River Thames from where the club now plays.